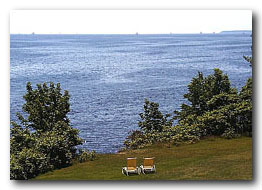 The High Tide Inn was formerly a private estate, and the Inn was the gracious home of the owners. It is now seven acres of beautifully landscaped lawns, flowers and trees, nestled at the foot of Mt. Megunticook, and sloping gradually down to the sea. 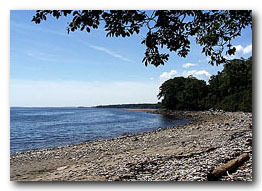 The affordable accommodations at the Inn, the cottages and the motel units are located well off the road with two hundred and fifty feet of private beach. The living room and the porch (where breakfast is served) are glass enclosed and offer spectacular views of the islands and all of the boating activities which unfold minute by minute. The porch is a great place to play Scrabble, cards, or your favorite family games. There are fireplaces in the living room and the library. Of course, all of the public rooms are at the disposal of our guests. The High Tide Inn, well off the road, offers a quiet and relaxing ambience, yet our location is within minutes of all the fabulous activities the Midcoast offers. For those who come to relax, our spacious lawns with comfortable lounge chairs and tables afford our guests the perfect spot to observe the tall masted schooners, the beautiful yachts that abound in this area, and the many lobster boasts hauling right off our private beach. The High Tide Inn has a private, rocky beach where you can come to catch some sun or stroll in the shade of old seaside trees, looking for driftwood, or just contemplating the passing sails. We have over two hundred and fifty feet of private beach for the use of our guests, and to be there on the nights when the moon path sparkles on the water is an experience not soon forgotten. 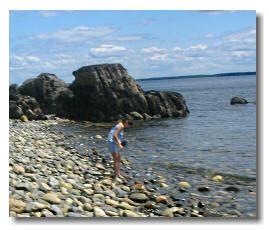 Especially intriguing is the occasional harmonic sound of the rocks being rolled away by the outgoing tide.At low tide, long walks along the shore, collecting shells and rocks, is a fascinating pastime. For nature lovers, we are just down the road from the Camden Hills State Park with all of it's winding trails along the shore and into the mountains. This is also the perfect spot for joggers, as it permits a safe, yet beautiful area, in which to run. The nature of the grounds and buildings encourage good companionship, and for some, new friendships are formed. 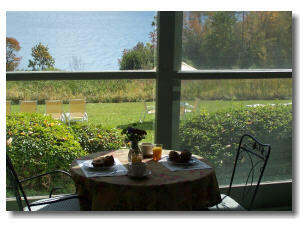 The grounds offer at the same time a refuge for those who come to simply relax and recharge their spirits. 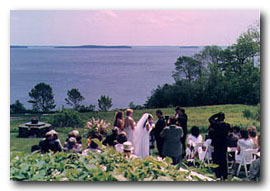 The High Tide Inn is also a beautiful and relaxing place to hold weddings, rehearsal dinners, family reunions, and corporate picnics. Call us for more details. Copyright ©1998-2013 by The High Tide Inn. All Rights Reserved.